First, when should you cut hydrangeas to dry them? Hydrangeas do best when allowed to dry on the plant before picking them. Experiment with harvesting from August through October. That is the best time of the year to cut hydrangeas to dry and preserve them. You can have beautifully dried hydrangeas that are as lovely as any you can purchase. When first starting to dry hydrangeas, I tried all the tricks I'd ever heard of. I slammed them into a hot car trunk, hung them up-side-down in a dry attic, and placed them in water that gradually evaporated. In every case, I ended up with wilted hydrangea blooms. The secret to perfectly dried hydrangeas is very simple. Wait until they are ready before picking them. The timing is much more important than the method one uses to dry them. While it is tempting to cut the hydrangea blossoms for drying at the height of their color, this doesn't work. Fresh, recently opened blooms, rarely dry well in the open air. Hydrangeas do best when allowed to dry on the plant before picking them. Experiment with harvesting from August through October. In the south, hydrangeas usually age to a blushing green color and then pick up shades of pink and burgundy as Fall approaches. In the cooler areas of the world, they seem to age to shades of blue and purple. They are both equally beautiful to me, but very different. 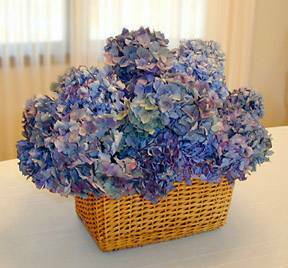 I like to purchase a few bunches on Ebay occasionally from gardeners who grow hydrangeas in cooler climates, just to enjoy the variety of colors. * Leave blooms on the shrub until late summer. Toward the end of the summer the petals will begin to age and take on a vintage look. If left on the shrub a while longer, many blooms will pick up interesting shades of burgundy and pink. The timing for cooler areas may be much different from this. We would like to hear feedback from the form below, from those whose drying experience is different. * One can cut the blooms, strip off the leaves, arrange them in a vase, with or without water, and leave them to dry. It is not necessary to hang hydrangeas up side down to dry unless the stems are very thin and weak. 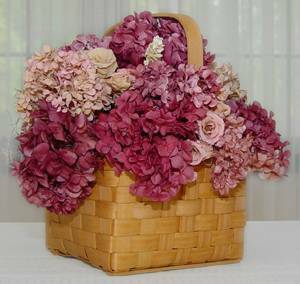 * To retain extremely natural hydrangea color, use Silica Gel to dry fresh blooms. For those that love the look of dried hydrangeas but don't want to do the work I have a shortcut! There are some very good faux dried hydrangeas & real dried hydrangea petals on the market. Below you can find some of my favorites.